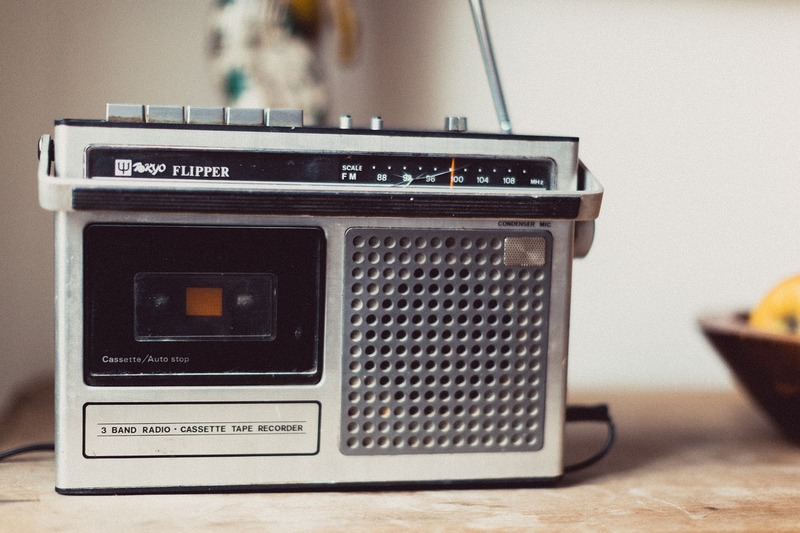 FM radio transmitter is radio transmitter that can be used for purposes like transmitting your radio signals throughout the air or for spying (eg.listening to one’s speech secretly). etc, Building and using transmitters are illegal and can put you in prison for a long time!, it’s better not to use this device against any person or for any kind of illegal activities, also building and using long range radio transmitters without a license is illegal in most countries because these unstable frequencies may confuse with fire,ambulance,police,aircraft frequencies. 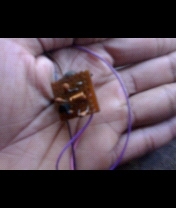 This circuit requires SMD components to make it as small as possible, so you need to get some SMD components such as smd resistors,smdcapacitors..etc you may get all these from junk(eg.damaged circuit boards, but you must test them before soldering to the pcb) circuit boards if it’s not easy to get from electronics components selling stores. You may need micro soldering iron although i used an ordinary one to get it all soldered, but it was quite hard to solder the SMD components onto the PCB using an ordinary soldering iron. Here is the circuit diagram of micro FM TRANSMITTER, just change every components in the circuit to SMD except the Transistor,coil, and two 15pf and 5pf ceramic capacitors. A tuning cap (variable capacitor) is not needed in the circuit, because you can replace it with a ’15pf’ ceramic capacitor, but if you want change the frequency of your transmitter, then gently spread the ‘spacing‘ between the turns of coils. L1 – coil, get a pen refill(must be 3mm diameter) and a short length(1mm thick) copper wire,wind exactly ‘6 turns’ over the refill and scrap its both ends with a blade. Done! 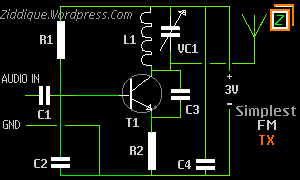 Note: a mic may be added in the circuit to transmit your voice, but you have to modify the circuit for this purpose!